Tick Talk » When you have a flat tire, stop and change it. « The highest quality money can buy. When you have a flat tire, stop and change it. “Why might I be writing about automobile problems?”, you ask. Well, its an analogy. We draw incredibly incorrect analogies between cars and watches all the time when it comes to service. We do it to prove a point, your watch needs to be serviced regularly even if the reasons are in fact quite different than the ones that apply to your car. This post isn’t about regular service however, it is about when things break. If your car gets a flat tire you stop and change it so you don’t have to buy a new rim. If it makes a terrible noise you get to the mechanic as soon as possible so it doesn’t do further damage. Well, with your watch it is the same. 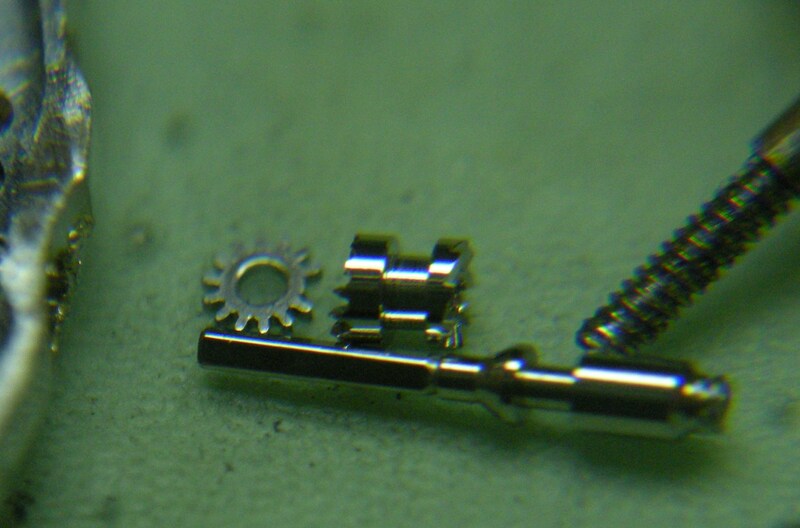 If you feel a grinding that is different when you wind the watch, have your watchmaker check it out. If your crown comes out, take it to your watchmaker, don’t try and put it back in your self. The setting wheel post on this caliber is known to wear. If caught soon enough the post can be turned down and a bronze sleeve installed to reduce the likelihood of further wear. In this case the post is worn too far to fit a bushing. I think it is possible (although I can’t confirm it) that incorrect service may have exacerbated the problem in this case. As the post wore the setting wheel was able to shift which would have made setting the watch more difficult. As you can see from the “collateral damage” that it got so difficult that it broke several teeth off of one of the setting wheels and half of the teeth off of the sliding pinion, but that wasn’t enough. With all of those components all jammed up the stem pilot broke off and then the stem broke off at the threads. 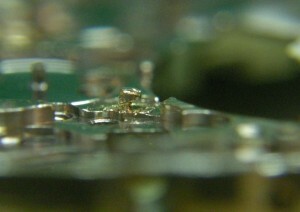 This allowed the crown to come out from the case. Damage from trying to re-insert a broken stem. 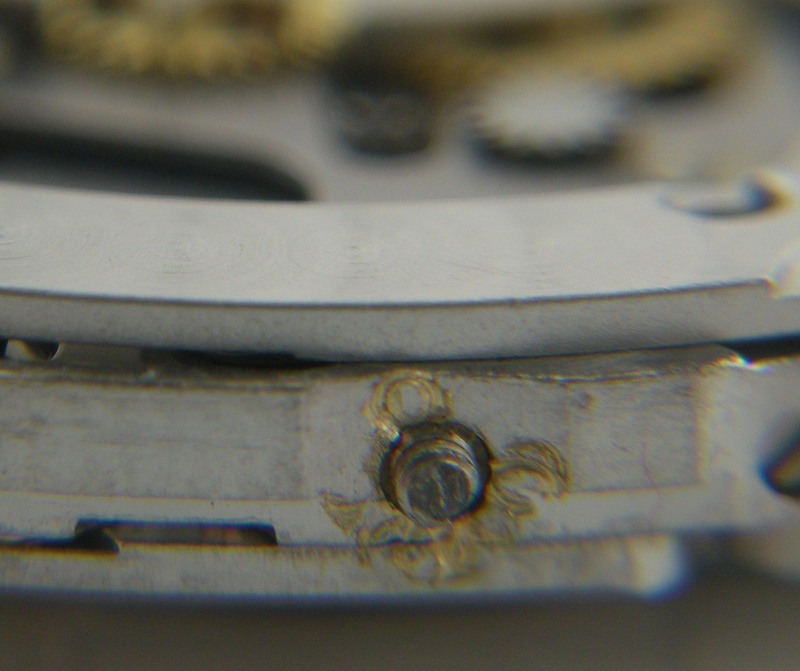 When the crown came off in the watch owner’s hands he clearly made several attempts to screw it back in to the watch based by the number of circles carved into the mainplate around the hole for the stem. The morale of the story is, when something in your watch just doesn’t feel right. Go visit your watchmaker and you could prevent several hundred dollars worth of damage. This entry was written by Jordan Ficklin and posted on May 3, 2012 at 7:35 pm and filed under Rolex, watches, watchmaking. Bookmark the permalink. Follow any comments here with the RSS feed for this post. Post a comment or leave a trackback: Trackback URL. That is, by far, the worst wear I’ve ever seen on a setting wheel post. Brutal. I’ve seen this quite a few times myself. Generally with a movement that has calendar complication with moon phase like the Omega 27DLP or the Eta 1100. I think the owners like to bring the hands around to watch the calendar functions click forward. They just don’t realise the wear they’re causing with every turn of the crown. 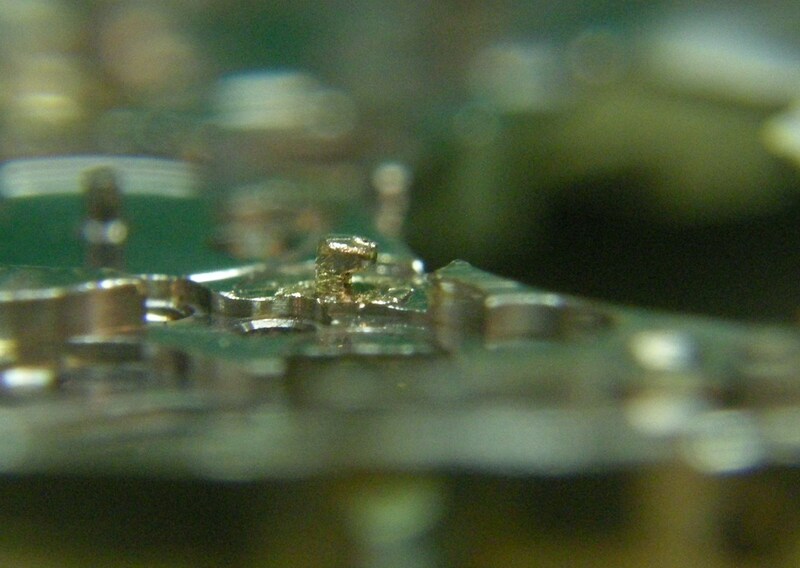 It is incredible to me this watch was allowed to get to this state of dis-repair.. Unlike flat tires,watches are more of a nuisance because you have to find an expert and in most case send your watch off for repair .